All discussions regarding classic/retro games belong in here. No matter which console or system, it's a welcome discussion. Last year, near the beginning of my own collection challenge blog, some members posted about the idea of a trade up the best stash of games challenge. I think the basic idea was to start with a certain amount of cash say £20-30 or whatever people were comfortable with - but we all started with the same amount. Then we basically just bought and traded video games only to see who could amass the best stash by the end of the year. You weren't allowed to go past the initial starting point. If anyone fancies giving this a go we could start it on 30th June and give us half a year to complete and then complete on 31st December. We could then have a members vote to decide on who they think has got the best stash in their mind. I would do this separate from my own challenge though and still carry on with that separate as I get funds for selling and trading other things apart from video games. This would have to be just video games only. Post below before 29th June if you're up for it and what you think is a suitable starting amount of cash. Last edited by n-g-m on Tue Jan 01, 2019 12:36 pm, edited 40 times in total. Even tho it's a bit hard to shift games around here, i'd be up for this. Sounds like fun, count me in. Sounds pretty interesting, is it purely video games, or would it include game guides, consoles etc? I'd be up for putting £30 into it. Adventure time, pokémon & GC. Definitely count me in - dont mind 25 or 30 quid or whatever. Got to draw the line somewhere so I guess just video games and nothing else? I'm happy to go video game consoles (if you're lucky to pick any up cheap enough) and I suppose game guides count as it's all related. I wanted to differentiate it from my own personal challenge which is basically where I pick up absolutely anything I can that I think I can create cash for. I'll keep entry open and rules up for discussion on this thread for up to 30th June. The official start date will be July 1st and end on New Years Eve at 11.59:59! What I plan on doing is asking for a photo of what you've got and what you plan on keeping and what cash you have left to purchase more goodies. I'll do a leaderboard similar to what Joe Boy does for the 52 game challenge. However, the difference being it will be up to the rest of the forum members to vote on what they feel is the best stash of games in their opinion. The person with the most votes wins. Keeps it fun and inclusive until the end that way. Admin - if this takes off, could this maybe become a sticky thread? Further ahead, if it goes down well, I'm more than happy to run it again if it gets a good reception. I’m up for this. Personally I’d throw it open to anything gaming related and start with a tougher £20 but either way. With the games market in donny on 30th of June can we start it last day of June instead as that seems a golden opportunity for anyone going to get started? Yes having thought about it for a bit I think it should be anything game related - be it consoles, controllers, peripherals, strategy guides, manuals etc. Having seen peoples' ideas we will go with anything gaming related so that includes: consoles, controllers, leads, games, boxes, manuals strategy guides. However, strictly no repro's of any kind. All has to be genuine stuff. Think I originally said start on 30th looking back to my original post so 30th it is. Are there any bargains to be had at Doncaster? I didn't get last time because of the weather and no-one near me seems interested this time round! I think I should be able to keep an Excel spreadsheet and then screenshot it to keep up to date. I should add that late entries are welcome so if you don't make it (or see it) by 29th June you can still sign up any time after. Reckon £25 starting cash is the sweet spot so we will go with that. Edit: If you run out of cash during the challenge then it isn't the end. You can simply sell something you were going to keep to raise more funds. Sounds good to me. This is what I do in a very slow, drawn out fashion anyway so actually documenting it over 6 months should be interesting. Re: Donny. I missed last time cos of the snow too, have been twice before though. First time I went my gut reaction was “wow, this ain’t cheap, even pricier than eBay in a lot of places”. If you’re patient and thorough there’s good prices to be had. I spent less than £20 each time as big hitters cost big bucks but found Cart Only games far more reasonable. Think my best buy was lost Vikings mega drive cart for £3, a good while later traded in to cex for something in the teens. Good choice though and lots of nice side interests like figures, books, decor etc. I just hope I don't end up with none of the 25 quid left. Its going to be a boot sale summer! Anyone else chomping on the bit for this? Had a few great buys to keep and sell on the last 2 weeks that won’t count. Having to really resist my trigger finger on the bid and buy it now ebay buttons lol. Yep, i've had some really good ones in the last couple of weeks. Like 30 ps3 games for less than £1 each. I'm sure i won't find anything good this Sunday at the car boot sale tho. Not really found much recently myself so hopefully I've not used up my good luck. I haven't been to many carboots recently due to work getting silly a month or so before the summer holidays begin. Good luck all and post your photos, games for the collection and profit/loss margins. Yep, Saturday is donny game market and the big kick off. Cos of the missus working and having the car on Sundays my car boot visits are sadly sporadic. Most of my wheeling and dealing is eBay based, with time and effort still bargains to be had for sure. My good form recently includes Mario kart 64 marked as faulty I took a punt on winning at £7.40, cleaned contacts and works fine, bin ribbon disc only for £6.50 and sonic gems on Gamecube for £4.20. We’re never talking big wins but enough to stretch the collection continuously on a tiny budget. I am on holiday this week and spent a morning with Mrs Nolivesleft scouring the local charity shops with great success for mainly ps2 and xbox 360 games. Starting the challenge for real on sunday with a boot sale though. Six contestants at the moment ready for the beginning of this challenge tomorrow then. Anyone else who wishes to take part may join in whenever - there is no cut-off point. I shall amend the opening post and keep editing it to show the results as we progress. All I need is a photo of your newly acquired goods and show much money you have left for the results. Feel free to add how much you paid for things and how much profit you make on deals that add to your funds as it makes it a much more interesting read. You can also never go broke - simply sell one of your prized assets to raise more cash! Seems like a brilliant idea! I hope its not too late to still get involved? Just picked this little bundle up this evening from gumtree and seems like a great starting point for this challenge. It was advertised at £15.00 but I offered £20.00 to secure the deal for myself. 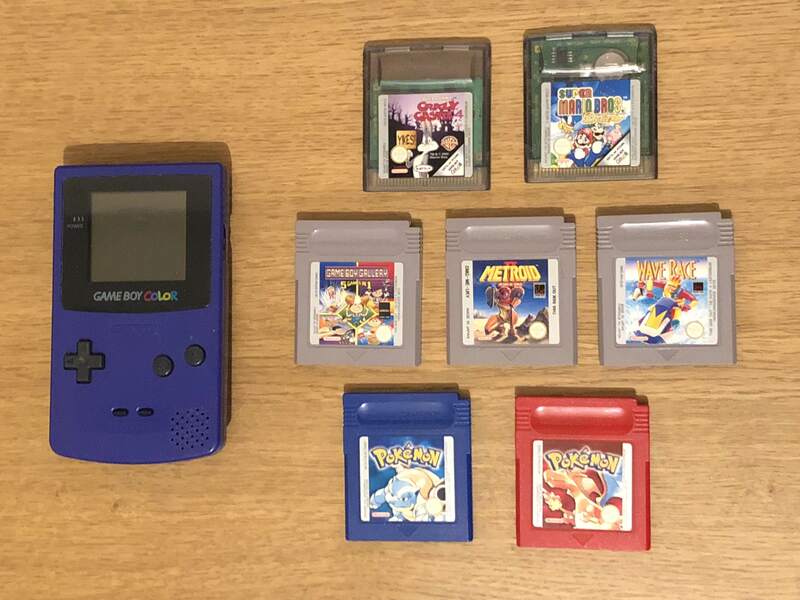 I currently own everything except the two GameBoy Color games so will be keeping hold of them. The rest will be for sale on eBay shortly. I will update this post as things sell to keep track of everything. As it stands currently I have £5.00 left in my challenge budget (assuming we all started with £25.00?) and I have added both Super Mario and Bugs Bunny into the stash. That’s a great start Munky, and never too late to join. Alas I didn’t find owt suitable for this challenge at the games market. Shoutout to gunstarhero though, I finally introduced myself after the 3rd time going and he saw me right with an almost criminally low price on a Gamecube wavebird. Top bloke.